Scandinavian Coffee Table Treats - A Discovery! Scandinavian Coffee Table Treats The best place to see and sample Scandinavian baking is at that adjunct of all well-run households, the coffee table. More than just a piece of furniture, it is an institution, a gathering spot, a focus for family activities. Here families meet during winter in common defense against the climate. And the table is never more appealing than at Christmas time when the variety of cookies and other baked goods is bound to be at its most astonishing. I recall the members of a large Danish family too busy with jobs and school to eat together very often, but certain, at 9 o'clock each night, to gather around an oval table in the parlor and exchange the news of the day over coffee. In summer, Scandinavians carry the table to the garden and sit there all through a long Sunday afternoon, soaking up the sun, while hornets drawn by the sugar icing form a menacing circle around the pastry. In the not so distant past all the edible ornaments of the this table were homemade, and to some extent they still are. Though more pastry is being bought these days it equals the home product in quality for a simple reason -commercial bakers in Scandinavia still have home-bakers to compete against. In the old days in Sweden custom prescribed that for an occasion such as a birthday, which no Swede is ever too old to celebrate, the housewife had to bake at least seven kinds of cookies, in addition to several cakes and pastries; but in these busy and calorie-conscious days she can be forgiven if she cheats a little and buys some of the things she needs, or bakes not seven different kinds of cookies but turns one dough into seven different shapes. In Finland, the custom was to serve guests seven items in all-always a braided yeast cake known as pulla; a pound cake; an elaborate filled cake; and four kinds of butter cookies. Guests usually began with the yeast cake and a couple of cookies; then, with a second cup of coffee, they ventured on to the pound cake and two or three cookies more, while making certain to reserve enough room for a piece of the filled cake and a third cup of coffee. 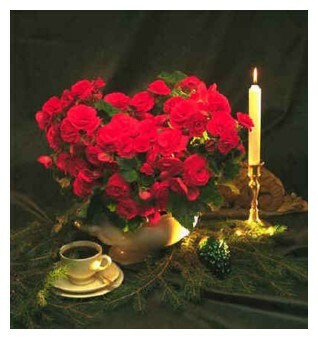 And anyone worth his manners was certain, with the fourth cup, to sample all the items missed before. This elaborate coffee table was always spread early enough in the afternoon to allow appetites to revive by evening. The bounty of today's coffee table offers an interesting insight into the nature of Scandinavian baking and Scandinavian hospitality, for the less well off the family, the more lavish the spread is likely to be. 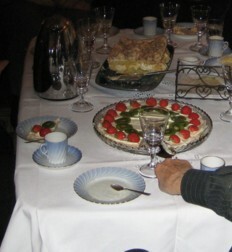 Danes in modest country homes, for example, would be embarrassed if they could not lay out for guests at a birthday party or coffee party some buttered buns; sandkage, or pound cake; a giant Danish pastry in the shape of a pretzel (the baker's sign in Denmark and Norway); a prune tart; a crown of meringue fluffed all over with whipped cream and studded with strawberries; an apple cake; a layer cake; and an assortment of cookies, blond with butter and shimmering like a diamond display with sparkles of crushed sugar. While such a party requires a great deal of advance preparation, more often than not the coffee table comes into use at a moment's notice, for in Scandinavia unexpected company is always expected. One of the secrets of Scandinavian baking.